Restorative yoga postures melt away physical and mental tension and deeply rest the mind and body. They also assist the body’s processes of healing injuries and recovering from illness by releasing tension to help and speed recovery. We will use props to support the body, encouraging deep relaxation. Using passive yoga asanas we let our nervous systems shift and enjoy the benefit of true rest. Different from more active styles, we will concentrate on surrendering our weight to supports and softening into the stretches. Our focus will be to calm and nurture ourselves on all levels during the class. Including Positive Affirmations, Visualizations and Chakra's work and meditation to enhance the experience. Yoga restorative poses help us to learn to relax and rest deeply and completely. During this deep relaxation, all the organ systems of the body are benefited, and a few of the measurable results of deep relaxation are the reduction of blood pressure, serum triglycerides and blood sugar levels in the blood, the increase of the "good cholesterol" levels, as well as improvement in digestion, fertility, elimination, the reduction of muscle tension, insomnia and generalized fatigue. Range of Motion: Yoga can keep the body's joints, tendons and ligaments lubricated and can improve range of motion, which allows you more mobility and agility. You have better balance and are less likely to fall and injure yourself. These benefits are important at any age, but especially critical as you get older. Better Circulation: Yoga activities come better circulation of blood throughout the body, including to the joints and muscles. This yields quicker healing of any muscle injuries and more nutrients coming to the muscles at all times. Pain Relief: Yoga can provide relief from back pain and arthritis. For lower-back pain, stretching the quadriceps and hamstrings as well as the hip and pelvis muscles can contribute to relief. Stretching and yoga can also ease headache pain by improving circulation and oxygen flow to the head. The relaxation aspect of stretching and yoga may also contribute to pain reduction. Relaxation: Yoga can be antidotes to stress, as they ease and loosen tight muscles and offer a sense of well-being and tranquility. In addition to the physical ways these exercises can provide benefits, the mental calm also contributes to relaxation. Some people have used yoga to cope with issues like anxiety and depression. Improved Posture: Better posture is another benefit to yoga. Tight muscles can contribute to bad posture, but stretching those muscles can improve alignment in your back and help posture. The particular areas of stretching that yield these benefits are the chest, shoulders and lower back. Discover the benefits of this powerful style of yoga that is gentle yet empowering. Whether you are looking to de-stress, energize, or find balance, restorative yoga can be an effective way to reach your goals for wellness. 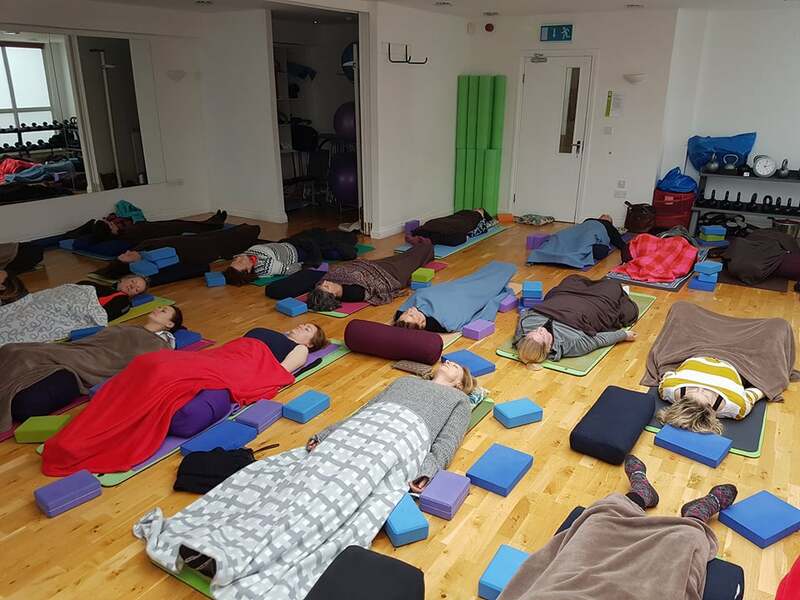 Yoga Fitness Dublin is by your side in the search for a more relax way to live. Come along or Contact Us to start to live your life to the fullest!